We all know that the Joker has a unique sense of humor. We should all be grateful that the fall into the Ace Chemical plant didn't take care of him, where would the Batman franchise be without him? The Penguin is fine but he's certainly no Joker. This clown has been keeping us guessing for years. Sometimes his humor isn't that funny but his punchlines are certainly unforgettable. The only thing funnier (as in odd) than his face and his twisted mind is his choice of weapons. His use of the acid flower is just unpredictable enough to make use flinch at the sight of any daisy, who knows what's going to come out of that. It could be poison, could be water, not a chance we'd like to take! The joker's most iconic instrument of revenge and destruction is the "bang" sign gun. 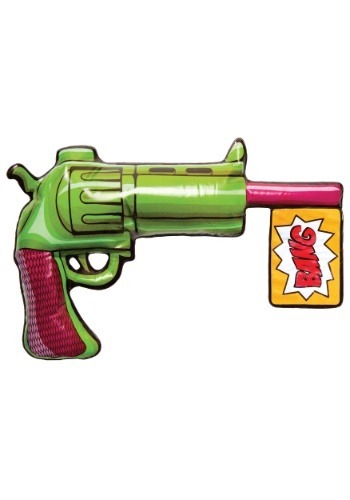 If you're going out as the Joker this pop art version of his weapon of choice will make your costume complete. Just inflate and enjoy your comic-like ensemble. Gotham City residents are sure to be amused.